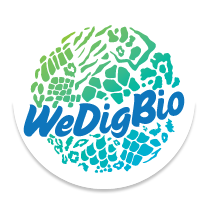 Get your WeDigBio stickers and tattoos! Thanks for being a WeDigBio host! Each year, we provide stickers and temporary tattoos to onsite hosts for you to distribute to your participants. Please follow the link below to provide us your mailing information. FYI: the WeDigBio logo, including these stickers and tattoos, displays a praying mantis when viewed with the Libraries of Life app! Also, if you haven't already, please register your event at SciStarter.com! CLICK HERE TO GET SWAG!